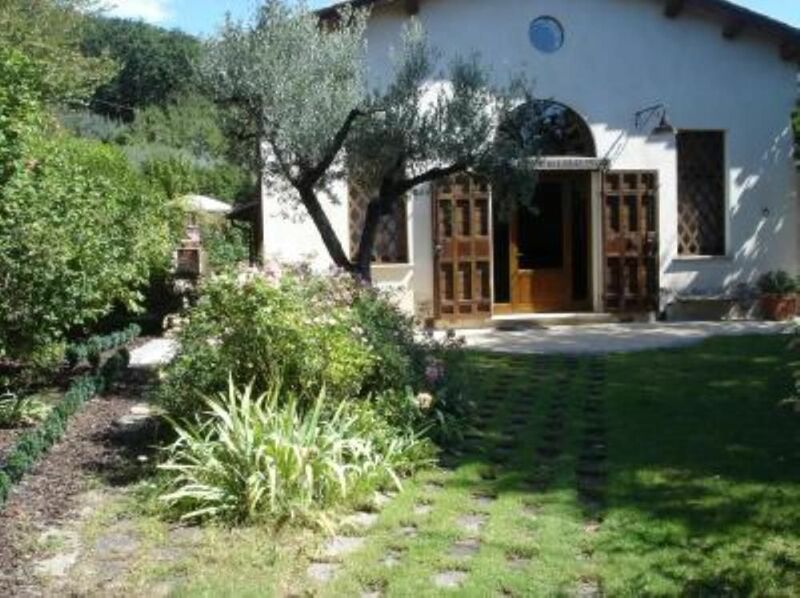 Old renovated farmhouse, large living room, 3 bedrooms, 2 bathrooms, 1 pergola. The house (200 sqm.) Has been restored respecting the local architecture. the interior of the villa retains its original charm of the old structure, but the kitchen, the bathrooms and the bedrooms are furnished in modern style. In a historic location it lacks nothing of the comforts to which we are accustomed in our homes. (Television, DVD player, wireless internet, music corner, board games). At 60 km from Rome it allows you to quickly reach the small towns of central Italy including Rieti, Assisi, Spoleto, Todi, Tivoli, Viterbo, Tarquinia, Orvieto, Spello ect. The ideal environment for a relaxing stay for sight seeing, physical activity (walking, horse riding and walking, cycling, tennis, gym). Possibility of being accompanied in these locations for artistic, cultural and gastronomic tours! Details: fax service at the home of the owner; Disabled talk to the owner. We spent an amazing week in this villa, the house has lots of space for children and adults to play and relax in and the terrace has beautiful views over the valley and across to the hill villages. Stefano, Gabriela and Eugenio were very welcoming but not intrusive. The pool was great for both children and adults, a good depth but with a shallow end for smaller children. "Accoglienti e non invadenti" è un giudizio semplice che ci lusinga molto. Vogliamo essere proprio così,di sostegno ai nostri ospiti nel guidarli alla regione e all'Italia. La famiglia Brickell è arrivata con precise esigenze e ci fa piacere che l'abbia trovate; una casa accogliente e grande abbastanza e la possibilità di fare affidamento sul proprietario. Mia moglie Gabriela ricorda simpatici intervalli e conversazioni con una donna intelligente e curiosa e che ha manifestato apertamente modi e stili di vita che noi condividevamo. Li ricordiamo con piacere spontaneo e sincero. Stefano anche per conto di Gabriela, Eugenio e la nostra Clio. We moved in the house after a hectic week spent at Roma. We felt immediately at home, everybody finding what they were looking for: reading, swimming pool, walks amid the trees. We discovered this beautiful region of Lazio on the advice of Stefano and Gabriela, which is not yet invaded by tourists. Our hosts took care of us as if we had been long time friends and we sincerely thank them for their presence and help in any case. We do recommend this amazing place and will definitely come back as soon as we can. "Les propriétaires sont adorables, La maison superbe, l''environnement superbe également, nous avons passé de merveilleuses vacances. Un seul défaut les trois chambres annoncées n''y sont pas!! Je dirais plutôt deux chambres et un grand placard (2m sur 2)!!" Take the A1 ROME FLORENCE and usicre at exit Ponzano Romano Soratte. Follow the signs to Casperia Cantalupo. 3 km after the village of Cantalupo, before arriving at the village of Casperia, the house is on the right opposite the junction for S. Vito, at number 90 of Via Roma. black iron gate, tufa columns with brick use, very green. Contact the owner by phone to arrange the arrival. Restaurants, Pizza, Pub and Wine bar have spread over the surrounding territory. you can enjoy traditional cuisine Sabine and Roman. 500 meters from the house there is a sports club with outdoor tennis courts. Equestrian center for guided horseback riding.